Courses begin each Monday during the summer. On arrival each student takes a test and is interviewed to ensure that they are placed in the correct class. Classes range from complete beginners to advanced. Discussions on English literature, culture and current affairs. Classes are carefully planned so that students progress step by step but they are flexible enough to accommodate the needs of individual students. Emphasis is placed on increasing the students’ fluency and understanding of the English language. We use the latest text books and a wide range of supplementary resources and a combination of modern and traditional teaching methods. All our teachers are highly qualified and experienced in teaching English as a foreign language and all are native English speakers. The first two hours of each day are based on the use of a course book with emphasis on grammar, function, vocabulary with reading and writing. The final hour concentrates on listening and speaking skills. 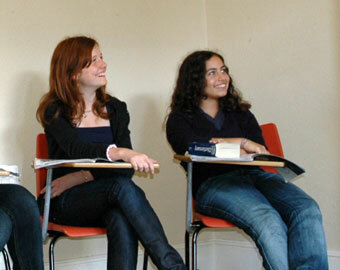 Those with a higher level of English take part in discussions and debates to improve conversation skills. The afternoon classes are more freely planned and continue to develop communication and fluency. They include group project work with newspapers and magazines, drama sketches, creative activities and games. Each student receives a certificate of attendance and report at the end of their course. * Outings are generally back between 4.30 and 5.00pm.